Family Blogging Month Winner ~ Hannah Demonstrates Karate! 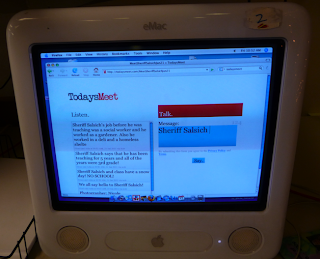 Family Blogging Month was a lot of fun, and Hannah was one of the top three commenters. 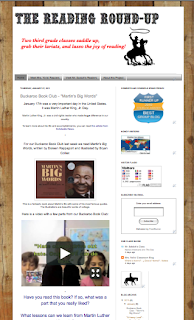 Each student won their own post here on Mrs. Yollis' Classroom Blog! Here is a video demonstration post Hannah created about Karate! Do you know any karate? If so, what belt are you? Which was your favorite combination? 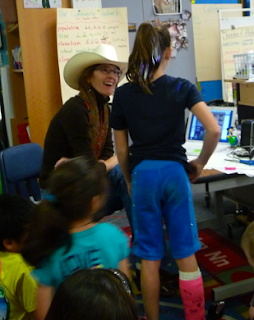 Last week, Sheriff Yollis and Sheriff Salsich circled their wagons and had the third Buckaroo Book Club! 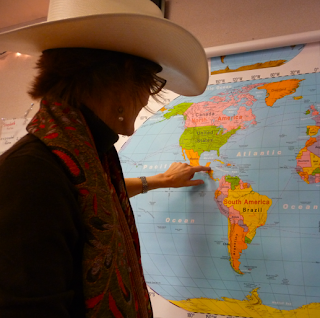 Mosey on over to the Reading Round-Up blog! Watch the Skype video of the jawin' that went on about a great America, Martin Luther King, Jr.
Nonno is Ben's grandfather who lives in Italy. He is a guest blogger. Check out his "Where's Nonno?" series below or in our archive! 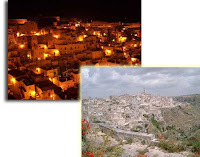 Here is his new post about Matera, Italy! 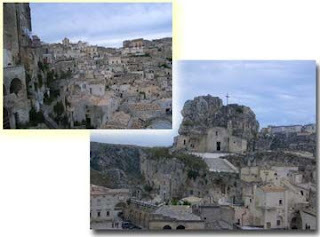 Matera - "Sassi di Matera" (meaning "stones of Matera"). 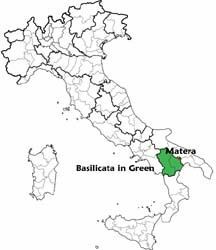 Matera is in the region of Basilicata, just next to Puglia. People have been living in Matera for over 9,000 years. The first people lived in caves above a small river called the Gravina. 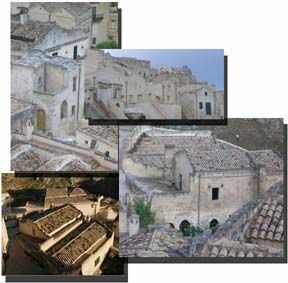 When they needed more places to live they would dig the rocks and build walls and roofs from the rock. Pretty soon they had a city of stones built above the small stream. There was no water, electricity, or plumbing. The streets in some parts of the village often are located on the rooftops of other houses. 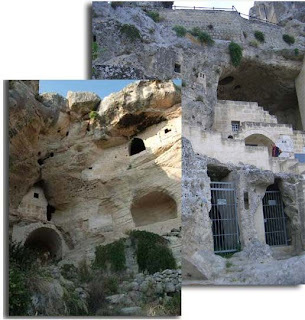 Because they had no water, they built their roofs so when it rained the water would drain to the edges and then go into special places in the caves called cisterns where they would store the water. They had no heat, so they would have their animals, donkeys and goats, sleep inside with them. 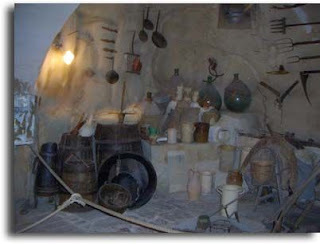 The people did not have many things living in the Sassi did but they had clay to build pots and utensils. 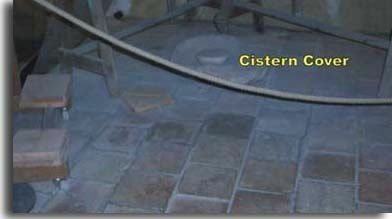 They also used clay to make whistles called cucus. 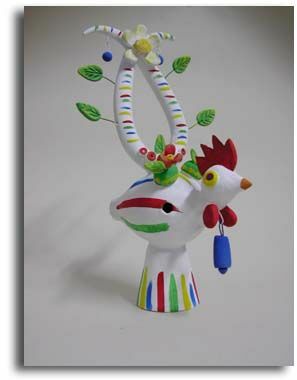 They painted and decorated them and the cucus became something special to have. 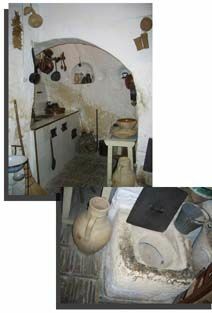 Just a few years ago the government forced the everyone to move from their cave houses because it was not healthy for people to continue living without the things they needed to stay clean. 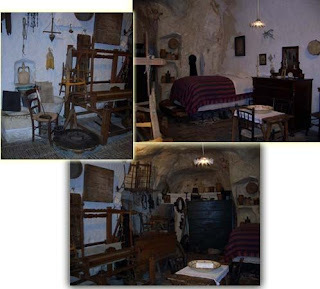 You may visit cave houses to see their sizes but they have been cleaned up for the tourists. 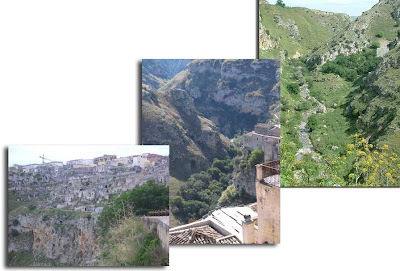 The people are now trying to bring visitors and promote the Sassi with the aid of the government, UNESCO, and Hollywood movies. Today there are many thriving businesses, pubs, and hotels. 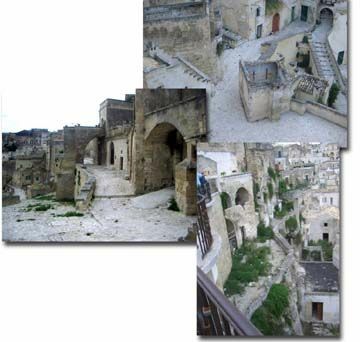 Many tourists now visit the Sassi. 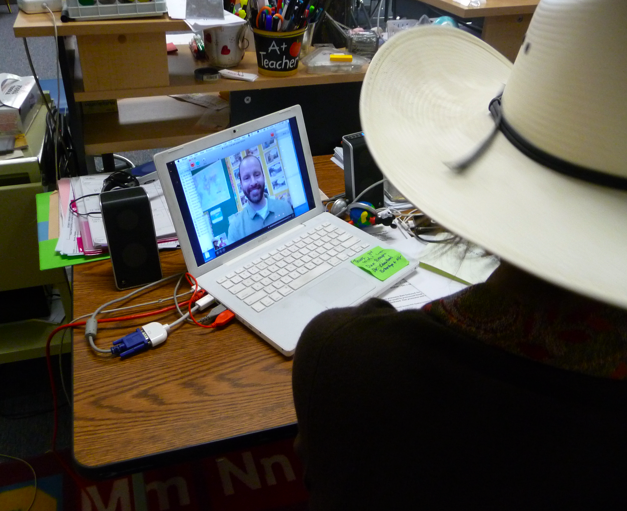 Every week, Sheriff Yollis' class and Sheriff Salsich's class meet for a Buckaroo Book Club on Skype over at the Reading Roundup! They've discussed The Garden of Abdul Gasazi and Thank You, Mr. Falker. The third Buckaroo Book Club was scheduled for today. Unfortunately, it was a snow day in Connecticut, so the students were not at school! 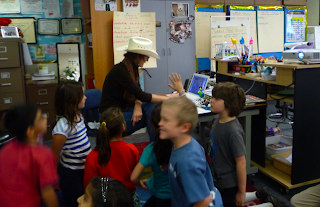 Fortunately, Sheriff Salsich was available! The citizens of Yollis county conducted an interview. Nicole was the photographer, Grace and Adia recorded the interview via TodaysMeet. 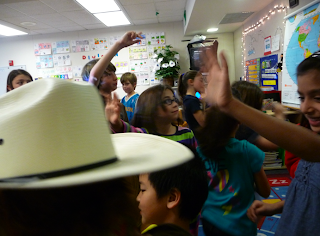 Students tried to think of open-ended questions rather than closed questions. Closed question - "Do you like teaching?" The answer is yes or no. Topics included: teaching, hobbies, and traveling. One hobby Sheriff Salsich enjoys is watercolor painting. He shared some of his work with us! 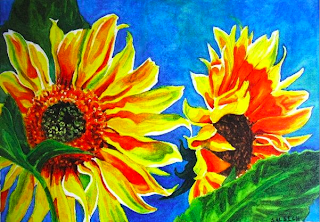 Here are some better images of the watercolors he shared with us! 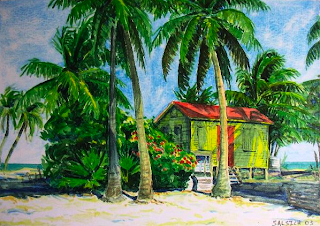 Sheriff Salsich lived in Belize for eighteen months. He had no electricity or running water in the village! Sheriff Salsich happily answered each and every question that the interviewers asked. Bye Sheriff Salsich! Everyone has to skedaddle! What did you enjoy about the interview? Why are open-ended questions better? Do you have any additional questions you'd like to ask? 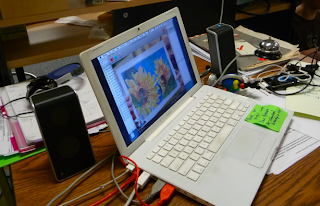 Yesterday, Mrs. Yollis and her good friend Mrs. Morris from 2KM in Australia were interviewed about educational blogging for a podcast called The Virtual Staffroom. 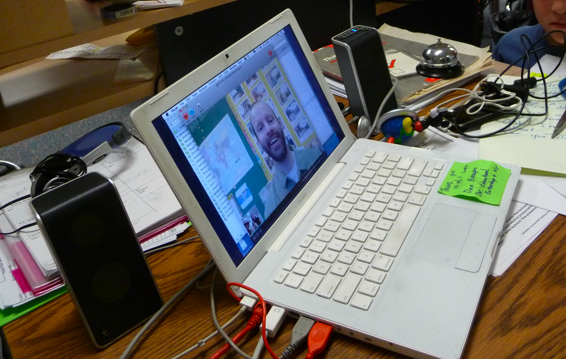 Chris Betcher conducted the interview via Skype from Sydney, Australia, where he is a teacher and ICT integration support person. If you'd like to listen to the one hour podcast, please visit The Virtual Staffroom! Do you have any other questions you'd like Mrs. Yollis or Mrs. Morris to answer? 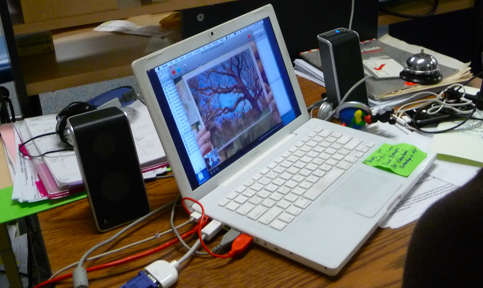 Have you ever conducted an interview or been interviewed? 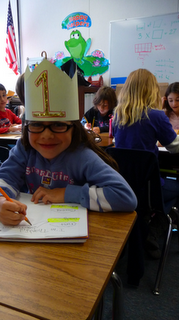 During Family Blogging Month, back in November, Adia was one of the top three winners. She and her family left over 60 comments on the class blog! Great family participation! 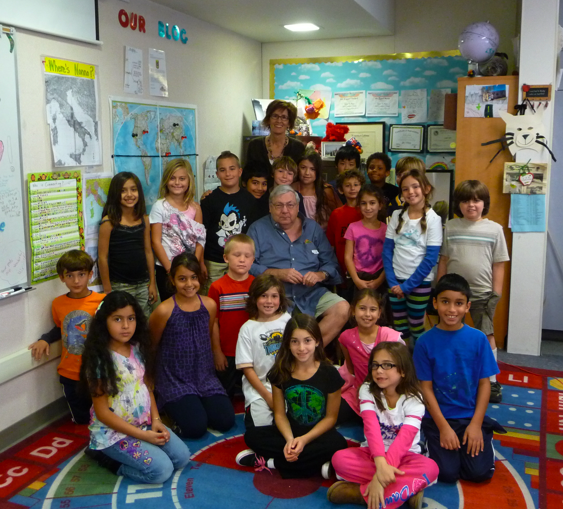 One of the prizes she was awarded was a free post on Mrs. Yollis' Classroom Blog. I decided to post about knitting because it is a very important part in my life, and I believe everyone should learn how to knit because it is a good strategy to calm yourself down. It teaches you a lot of patience and is really fun once you acquire the necessary skills. My knitting basket where I keep my colorful yarn and needles. I will teach the regular stitch today. The tools you need are: Needles and yarn. Needles and yarn can be located in local arts and crafts stores or fabric stores. Second, I will teach you how to cast on. Take the bottom of the yarn. When you do that, place your pointer finger through the yarn, and your thumb looped inside out. Take the needles and bring them between the holes. Pull the string tightly and repeat that 20- 40 times. Just for fun if you want, you can do it as long as you want, but not more than 200 times. Now I will teach you how to do an actual stitch. Make a loop with your fingers. After you follow that instruction, try to get your needle into the loop that you just did. Wrap the yarn around one of the needles. Pull the needle through and there you go, your first stitch! Keep doing that until you finish the row. Here is a picture of my finished projects: my potholder, purse, and scarf. Have you ever knit something? Have you ever been given a knitted item by someone special? Knitting teaches me patience and it calms me down. 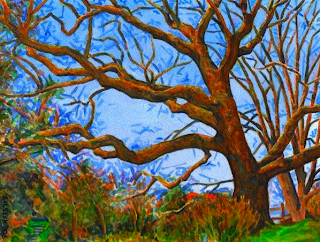 What hobby teaches you patience and calms you down? Here is his new post about Otranto, Italy! 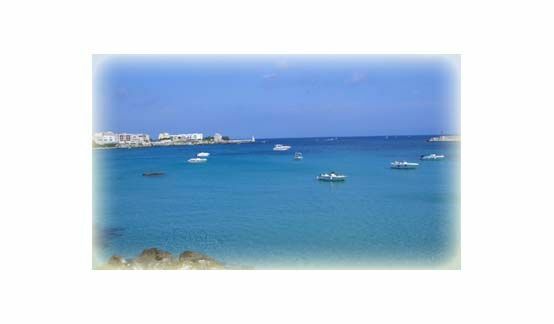 Otranto is a village on the Salento Peninsula of Puglia. 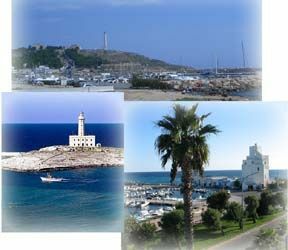 The people that live there call the peninsula " The Salento". 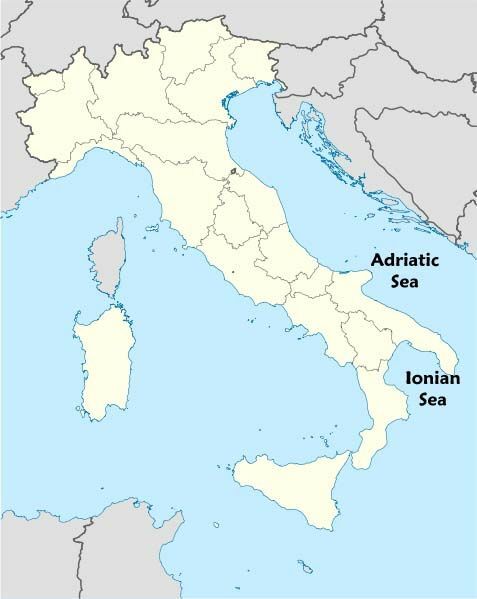 It has two seas, the Adriatic and the Ionian. 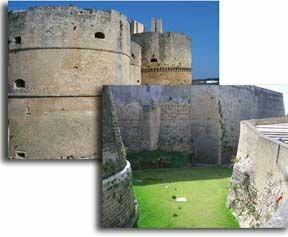 Otranto has a pretty harbor with hotels, beaches, a village and a huge fort. Salento peninsula was considered for centuries the 'door of Italy'. 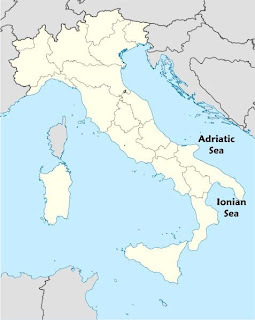 Salento after the fall of the Roman Empire was invaded by many different countries around the Mediterranean Sea. 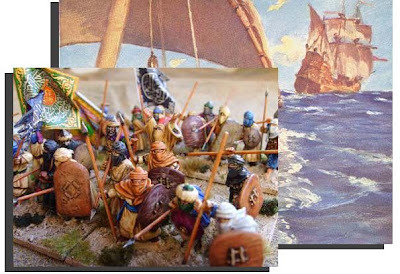 Forts were built to defend the land. They were surrounded by big blocks of stones. 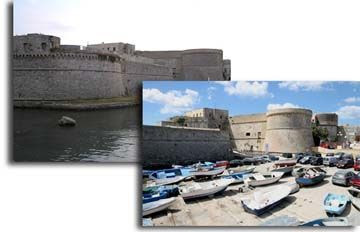 These huge forts of defense were used for more than 1500 years especially after the fall of the Roman Empire. 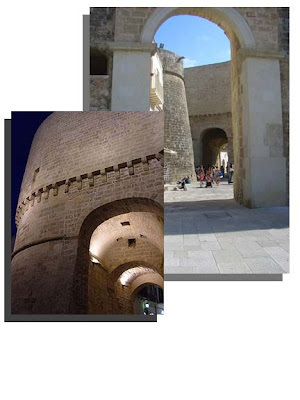 ﻿Below is the entrance to the Fort of Otranto. If you look at the ceiling of the entrance you can see openings that were used for defence. 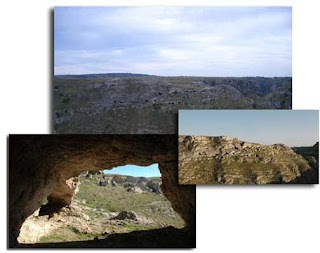 The people inside could shoot down arrows or throw down rocks or boiling water on the attackers. 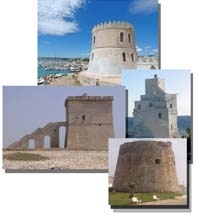 On both the Salento coasts there were many, maybe more than 58, towers on promontories or high locations. Some of them still preserve all their magnificence, some have been modernized for lighthouses and some are just ruins. During many invasions they were used as sighting towers so the defenders could see the attackers out at sea. In older times, the towers were landmarks for sailors, they identified places and they made the coastline area special. 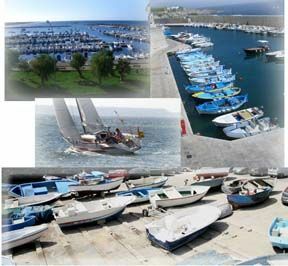 Even though centuries old, they are still important markers for modern sailing. 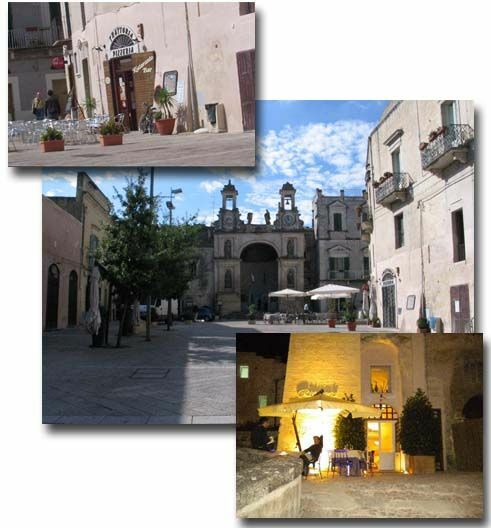 And now The Salento is a place for tourists who visit Alberobello and the trulli; Cisternino for dinner at the butcher store; Matera for the Sassi; ancient castles, forts and towers and to visit the beaches on the two seas. The fishermen still fish, tourists visit and boat. 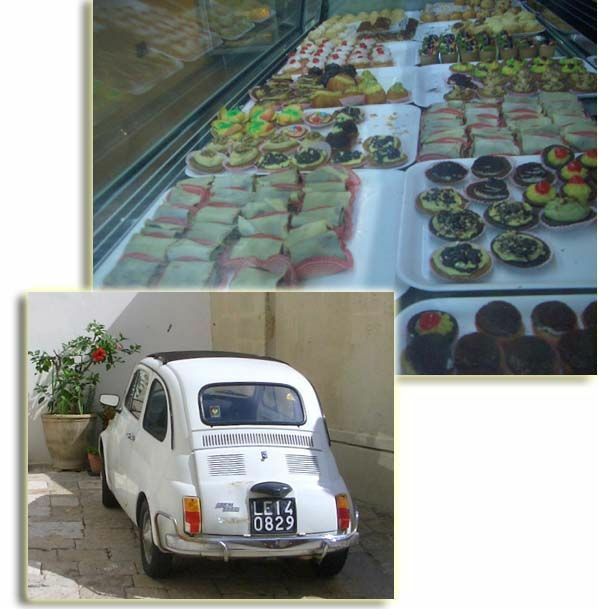 You can see movie star cars and of course always have sweets (dolce). 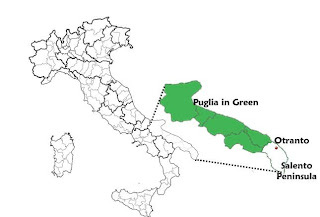 So this is maybe the last post about Puglia, I will miss the the Trulli, the Sassi, the seas and most of all the nice people we met, the history and this special place in Italy. We saw again an old friend Gianni Zizzi and had lunch with his mother and ather at their house and his mom made orecchiette by hand. In Matera we had dinner in an ancient cave. We walked in old forts and had lunch on the beach. Lots of fun! Now we head back to home to Courmayeur and we have a lot to tell you about where we live. What did you like best about Puglia?